A Lee County Schools social worker got the surprise of a lifetime, when he was named the 2018-2019 School-Related Employee of the Year. 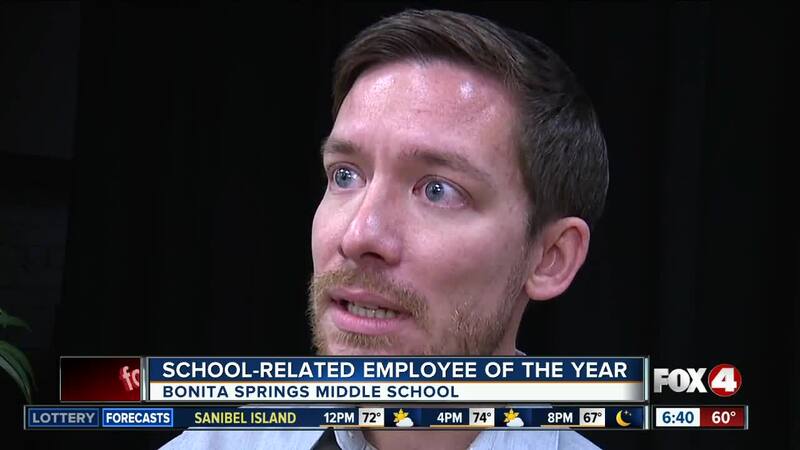 LEE COUNTY, Fla.-- A Lee County Schools social worker got the surprise of a lifetime, when he was named the 2018-2019 School-Related Employee of the Year. Paul Milford works at Bonita Springs Middle School. He's been in the Lee County School District for three years. Milford is described by his colleagues as a "go-getter" who sets the example of what it means to put your heart and soul into your work. "I just come to work everyday and I do the best I can and I love doing what I do. I guess somebody noticed, and now we're here", says Milford. "One of the big things that we're doing this year is implementing the mental health piece in our schools, so we are working with students and their families to help support our students with mental health concerns."